reluctant to share it with others. A man gets up one morning and he leaves his family. A man gets up one morning and he finally leaves his family. They need him now more than ever. This is the fear that he wakes up with every morning. There is the fear that he wakes up with every morning, that he is back there and it is still happening and they never got out. It is still happening and they never got out and he wakes up every morning, never knowing when they might come. There is the fear that he wakes up with every morning that he is still here. Won’t ever go back. His taste buds. His taste buds will no longer be his taste buds. He knows he will forget. He wakes up with fear. So he gets up one morning and he leaves his family. He leaves his family and he walks down the stairs of a tenement building. He goes down the stairs in the tenement building and every door is locked and he does not and he does not how to speak to any of them. It is early and he does not even know where these people work. It is early and his family are sleeping, so he goes down the stairs. He steps into the street. It is not so early that it should still be dark. But it is still dark. the street lights shine through his curtains when he can’t sleep and it is still dark but it is already morning. To go and get the smell of early morning bread? They pay to drink coffee. Out of paper cups. This street is pedestrianized. He is a pedestrian. He gets up another morning and he leaves his family. Why does no one watch watch every single little thing that he is doing? He knew people who looked. Is it safe in the early morning, in the darkness and the rain? While no one is looking? His coat is stupidly thin, to keep out the cold of winter, to keep out any of the cold of winter, let alone the rain seeping in. But his small rucksack is heavy. It too is wet in the rain. They tell him they are looking for a better coat for him. They tell him they are looking for a suitable coat and he does not know what that means but at least there is a coat for his son and a coat for his daughter. corroded crevices add to the interest? It is the message not the image which is of interest. He walks up to the building and he knows that it is important. He supposes that the building is beautiful. He supposes that in its own way, it is meant to look beautiful. He walks up to it and it is an art gallery and he remembers. Art. Such things. He thinks of pictures and words and shapes and colours and explosions He thinks of songs and rhymes and sculpture and music and a roar of noise. He thinks of dreams and drama and messages and ideas. He thinks of voices. He thinks of people’s voices being heard. He thinks of everything art can be, that he knows that art can be. He sees a sign. So it is time to act. He sits down on stone steps, lets damp seep into his trousers. They are thin and he does not care and they are stretched at the seams, but it does not matter. They will not let him in the building for another three hours. He sees pots. He sees pots and signs and writing. 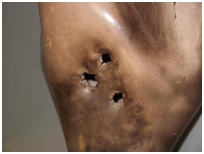 Note – the hole was not made by a bullet. For the creative dissertation of the MLITT, Stephen submitted the first section of an experimental, fragmented novel based loosely around the Japanese art of Kintsugi. This artistic philosophy treats breakage and repair as part of the history of an object, rather than as something to conceal which, lends itself to exploring issues to do with mental health and belonging. Cracked, part two is one fragment from this novel in progress.